1023/1025 Neon Forest Circle: This two-unit courtyard building sits on the south side of an east/west boulevard at a T-intersection with a north/south street and adjacent to a pedestrian path to the west. 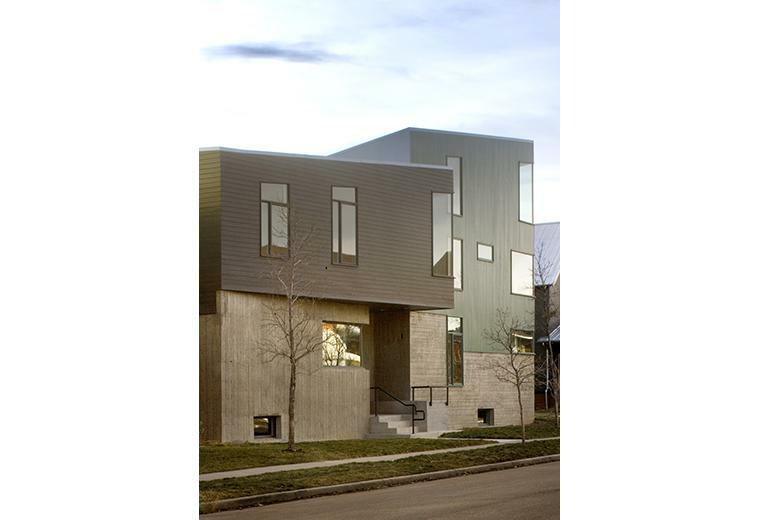 The western unit, which is sited on axis with the street centerline, rises to three stories to terminate the axial street-view, and command a western mountain vista. The front facade of the two-story eastern unit cantilevers beyond its neighbor to capture the western view as well. The base of both buildings, together with the freestanding wall along the path, are made of board-formed concrete, to shelter the ground floors from the intersecting street and to provide a continuous pedestrian experience across their front facades and along the adjoining path. The wall serves also to define the western unit’s court, and to screen its uncovered accessory parking space.